A collection of investments all owned by the same individual or organization . A portfolio that provides the greatest expected return for a given level of risk , or equivalently, the lowest risk for a given expected return . also called optimal portfolio. The line on a risk-reward graph comprised of all efficient portfolios . A search for Efficient candidate Portfolios from a collection of potential Investment Opportunities. Performance – Resources found, Production & Earnings Goals, Minimum acceptable results. Projects where you have an opportunity to invest capital with estimated, but uncertain, profitable returns in the future. View the Project Metrics and Flows. S1D1 Query: Project Scalers with Flow Data oriented with Line Items in Columns, Years in rows. Customized weighted project selection based upon good heuristics. Each trace calculates has up to 50 Portfolio points. Each Portfolio point has two confidence curves at isotiles (every 5%) for MMBOE and NPV written to the database. Available for sale from WiserWays. View the Portfolio Confidence Curves and Project Funding. Capex, Cash Flow, Return on Capital Employed (ROCE), and Efficient Frontier constraints. Looking at the Cash Flow Profiles, we decide $750 MM in negative Cash Flow is the most we can stand in any year. We choose the ¼ closest to the efficient frontier of the NPV – Downside Risk plot. Most of those selected are on the efficient frontier of the Reserves DS Risk Plot. Next we inspect the NPV Confidence Curves. Now we inspect ROCE for year 2007 against NPV. We now ask, what if we need 2006 ROCE > 10%, what do we give up? there are 6 different “traces” or Portfolio Builds. and see which Projects are never funded. The Projects, and how many times selected in the marked portfolios and at what average working interest. Define a set of Strategies for funding candidate portfolios. Use an automated process to generate thousands of candidate portfoilos according to the different strategies. Apply/change constraints by sliding Spotfire query devices. 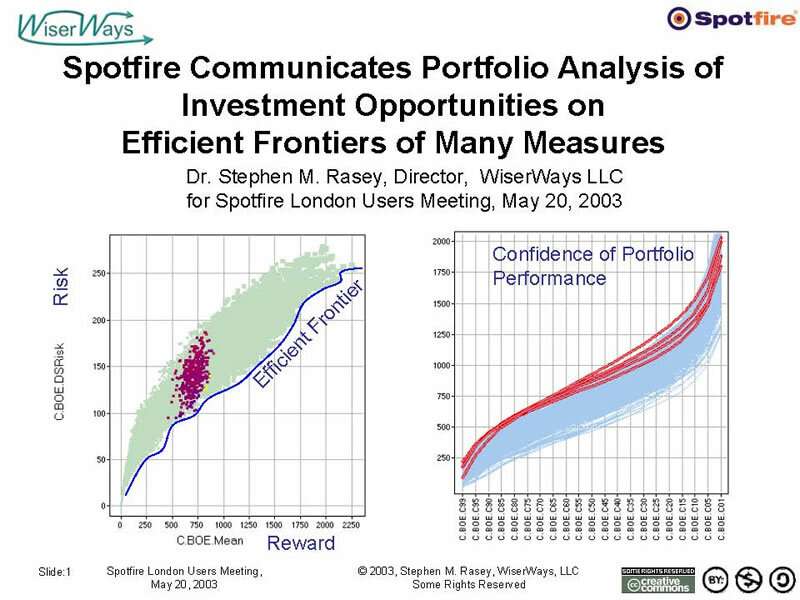 Select many good portfolios that are close to the Efficient Frontiers of many different measures. Find the projects most often funded in these good portfolios. “A Manager does not want, and will not pay for, an OPTIMUM solution. He wants to be better off now, as quickly and as cheaply as possible. DECISION MAKERS can see available alternatives and the degree of difference (or equivalence) between them. You can change your constraints in the conference room for real-time turnaround. For the opportunity to speak here and for the work we have done together since 2001. For helping me debug the Access-Spotfire interaction. Who in 1997 triggered my insight in how to develop the WiserWays Multifield Confidence Curve Portfolio Calculator. And Thank You for your attention.